As a reviewer, I often have the pleasure of reviewing curriculum from "new to me" companies, and then I often have the pleasure of reviewing from a trusted company. It's always exciting when I see a company we have liked, offering another product in a series we like. This time, I'm happy to share with you a review from Memoria Press. We were eager to request New American Cursive Book 3 (Famous Quotes), after reviewing Book 1 in the past, and another child currently using Book 2 with success. My oldest son successfully used Book 1 when we reviewed it a couple of years ago, and he was the one that had recently asked for a workbook for extra practice to work on his cursive a little more. 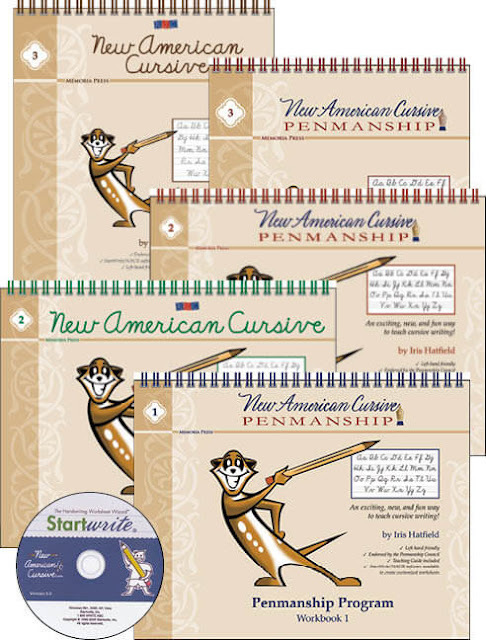 Memoria Press starts cursive around first grade, and the New American Cursive series series is labeled on their website as 1st-4th grade, so book three is designed for mid-elementary, but can easily be used with slightly older students. My 5th grader doesn't need a Meerkat mascot, but he has no objection to the book either. I do like, though, that the books are marked 1, 2, or 3, instead of by grade level. The third book in the series continues the simplified letter form developed by Iris Hatfield. The book includes a Teaching Guide, 100 exercises and blank reproducible practice pages. The book is bound at the top, to make writing easier for left-handed students. The series slowly decreases the font size. This book in particular starts with mid-lines and 24-point font, and decreases to standard 18 point size. This gives students the opportunity to decrease their writing size and write more fluidly as they build skill. The books are labeled 1-2-3 instead of by grade level, which I think is always beneficial in the homeschool world. The lesson plan is fairly simple. There is one lesson per page, and each lesson is designed to take approximately 10-15 minutes. Since a typical school year is longer than 100 days, this automatically gives you a cushion for when days are busy or kids are sick. There are journal pages in the back for students who finish early (this is designed for a classroom setting, but homeschoolers should enjoy journaling opportunities too) and there are ideas for including more lessons if you need them. The book starts with a thorough review of letter formation, connections, size, slant and spacing, as well as a gentle reminder to students on how to properly sit and hold their pencil and paper. There is a Quick Guide of Famous Quotes, in alphabetical order, but the student is instructed to write them on a separate piece of paper. There is a section on signature training, and even a page full of famous signatures! 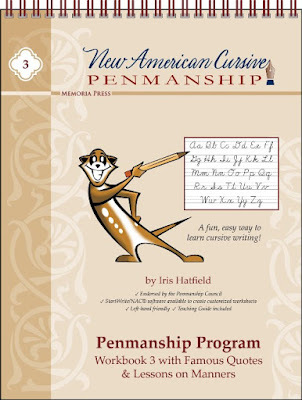 As you move through the book, the instructions are given in cursive for practice reading in cursive, and the assignments become a bit lengthier. Sometimes there are quotes or passages to copy, and sometimes the student is instructed to write something of their own, to encourage creative writing. There are still drawing/artwork opportunities throughout the book, which both of my kids have loved with this series. The New American Cursive font is simplified, with less strokes, but technology has changed the use of handwriting and cursive, and while the benefits of cursive remain, it is not quite the art form of years past. The font allows for legible, quick handwriting and minimal frustration. If you're looking for a cursive program, we do recommend this series! The Homeschool Review Crew is also reviewing Books 1 and 2 in the New American Cursive series, as well as logic and composition curriculum, so be sure to check out more from Memoria Press!